It's the new year and the media is inundated with healthy living hacks and tricks. My social media feed is flooded with people trying 30 day nutrition challenges and starting new diets. If you are an athlete, you can safely ignore 99% of this noise. Most diets, nutrition and weight loss challenges are nothing but a distraction for athletes. If you want to get back on track after the holidays, the sane and sustainable way is to simply return to the basics. If you want a new year challenge, challenge yourself to ignore all extreme diet and exercise protocols and follow these five steps to eat like an athlete. What do you need to eat in order to look, feel and perform your best? Balance comes naturally when we focus on consuming mostly whole, minimally-processed foods from nature. One easy way to shop for whole foods is to limit foods that are in a box or package. When choosing packaged foods look for short ingredient lists that you can pronounce. Stick mostly to the meats, fish, fruits, vegetables, nuts and seeds. Whole foods gives us the energy we need to perform our best while providing necessary nutrients. While it may be a popular trend to go low-carb, it simply isn't necessary or optimal for athletes. Carbohydrates are our body's preferred energy source. The key is to eat quality carbohydrates and time them around our workouts. Plan whole food carbohydrates before and after your workouts for best results. How to cut carbs without cutting your sanity. We need protein to build and repair muscle and it helps us maintain lean muscle during weight loss. Protein helps us feel full for longer after we eat and our bodies actually burn more calories to process protein than carbs or fats. The National Academy of Sports Medicine recommends 0.4 grams of protein per pound of bodyweight for the average, sedentary person, but we're not sedentary or average, right? For athletes the protein requirements go up. For strength athletes the recommendation is .5 to.8 grams per pound of bodyweight and for endurance athletes (runners, that's you) it's .5 to .6 g/lb. Challenge: For one day add up all the protein grams in the foods you eat. Are you getting the recommended amount according to your bodyweight? If you weigh 150 lbs, you should aim for at least 75 grams of protein a day. How does your diet measure up? You can read more about getting more protein in your diet in this blog post from last year. Red, orange, yellow, green, blue, purple. Can you get in all the colors in your fruits and vegetables? Vegetables are high in fiber and nutrients and generally lower in calories. They help get your digestive system healthy and um...moving. They help you feel full and are virtually impossible to overeat. Think outside the box about what fruits and vegetables you can try. 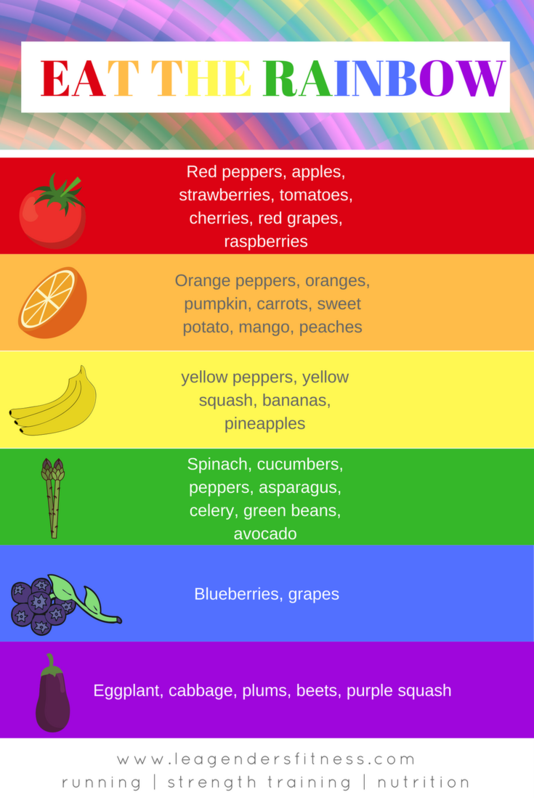 Next time you're at the grocery store try to pick at least one fruit/vegetable from every color in the rainbow. There's a challenge I can get behind. Here are 10 easy ways to add more vegetables in your diet. While we could all probably stand to reduce our sugar intake, athletes don't need to worry much about natural sugars, those found in fruits and dairy. I suggest limiting your added sugar intake to about 25 grams per day. For one day, count the sugar grams listed on the back of the packages. Even if you don't usually eat traditional sweets like chocolate, cookies and cake, sugar is lurking in everything from ketchup, salad dressing, soups, granola and pasta sauces. If you don't pay attention it can add up quickly. When counting daily sugar grams if it is a natural sugar found in fruit and dairy, you don't have to count it. As athletes our bodies need some natural sugars to perform our best. Some foods have a combination of natural and added sugars. You can tell the difference because you won't see natural sugars on the ingredient list. When you see some of these sugars on the ingredient list, you know they are added sugars: cane crystals, corn syrup, dextrose, evaporated cane juice, fructose, fruit juice concentrate, glucose, high-fructose corn syrup, molasses, syrup. Tricky, huh? If you drink milk, then the sugar content listed on the label is natural sugars. If you drink chocolate milk, then the sugar listed on the label would be a combination of natural and added sugars (you can tell because the added sugars are listed in the ingredient list). If you eat plain yogurt, the sugar content listed on the label is natural sugars, if you eat flavored yogurt, the sugar content is a combination of natural and added sugars. Flavored yogurt is notorious for having a lot of added sugar. (Sometimes as much as a cup of ice-cream!) Try plain Greek yogurt and cut up berries or fruits for flavor. Add up the sugars you eat in one day and see where you land. Are you consuming 25 grams or less? You don't need to count the sugars in the fruit and dairy that you eat. How did you do? I wrote a few blog posts on the sugar if you want to dive a little deeper: 25 grams of added sugar per day, and a rant on sugar. 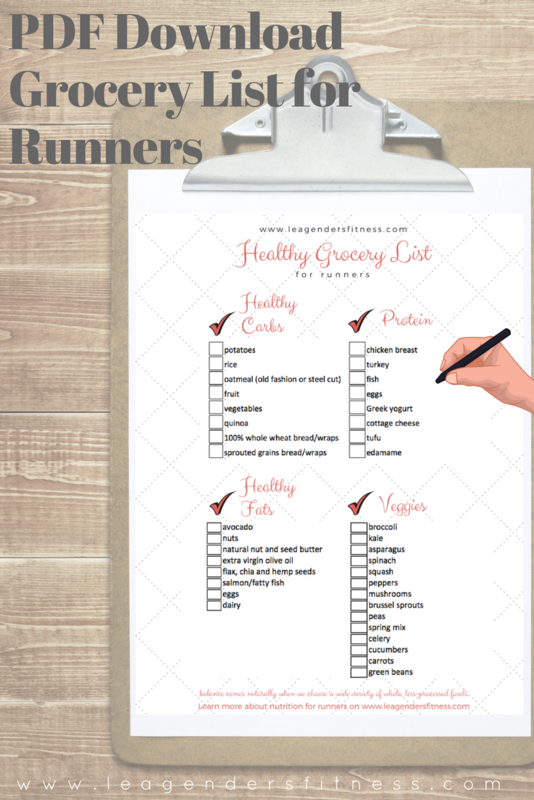 download the free printable PDF healthy grocery list for runners. Save to Pinterest for later. Add your email address to download the printable grocery list for runners and to receive news and updates from the strength & running blog. Thank you! Click here to download the grocery list for runners. Questions? I'd love to help. If you are tired of nutrition challenges that don't provide long-term results, join me in my 12 month nutrition habits program for sane and sustainable results. If you know what to do but haven't been able to stay on track or if you are confused about what changes to make for the biggest results, this is the program for you. The first month is 75% off to try. Put the quick-fix mentality behind you and make lasting changes once and for all. See if you are a good fit. Like this post? It helps me when you share with your friends and followers.